New England Patriots: Running Game No Longer Running to Stand Still? The NFL season is heading down the home stretch as evidenced by the return of NFL football on Saturday night. The New England Patriots in one week went from looking like they would be playing in the Wild Card round to the top seed again in the AFC. However, as quickly as it swung to the favor to the Patriots, it can swing back. Last night, the Dallas Cowboys almost did a favor for a number of AFC squads by almost hanging a loss on the Wild Card New York Jets deep in the heart of Texas. The Jets needed to late drives to overcome a poor kicking game (missed field goal, extra point, bad punts) and hang on for a desperately needed win 19-16. Staying in the AFC East, the New England Patriots are running out of running backs and have signed free agent Montee Ball (a second round draft pick in Denver) and had veteran Steven Jackson in for a visit this week. In a typical Patriots maneuver, it was an unknown running back added to the roster as former U of Hawaii player and practice squad fullback/running back Joey Iosefa. Evans was released by the Dolphins and had just one carry in 2005. The Patriots were sitting and 4-4 and had just been blown out in Gillette Stadium by Peyton Manning and the Colts 40-21 and it was not even that close. Early in the third quarter it was 28-7 Colts and while it had been close earlier, it was a Corey Dillon fumble which opened the floodgates. Dillon had just 40 yards on 12 carries and averaged just 3.5 yards per carry for the 2005 season. He was injured and missed the next three games: Enter Heath Evans. Evans rumbled for 21 yards on his first carry in New England against Miami the next week and finished with 17 rushes for 84 yards. In addition, he added 16 rushes for 74 yards in a win the next week. Evans was a role player from then on out as Dillon returned shortly but Evans established himself as a player who head coach Bill Belichick and Tom Brady could trust on offense. Evans stayed a few years and now has a good gig as an analyst on the NFL Network...something not likely to happen without his high-profile role in New England. No one is expecting Iosefa to come in and roll for 80 yards on the ground this week against Tennessee, but an opportunity to make an impact is upon him. Jonas Gray took advantage of his opportunity for one week last year (before he somehow got himself deep into Belichick's dog house), and Iosefa could be the next. Look for number 47 in the backfield against the Titans and remember this could be a big game for a player expected to be a minor contributor in New England. The New England Patriots are facing off against the Houston Texans on Sunday Night Football. While the Texans are currently on the outside looking in at the playoff race, they are a unique opponent as defensive coordinator Romeo Crennel and head coach Bill O'Brien are both long-time New England assistants under head coach Bill Belichick. Can the Texans' strong pass defense slow the Patriots passing attack? Can New England take advantage of Houston's weak run defense? Who covers DeAndre Hopkins? Is the success of Houston's running back by committee a trend or a mirage? Get ready for Sunday Night Football with What to Watch For (W2W4) when the New England Patriots travel to Texas to take on the Houston Texans. The New England Patriots return home to Gillette Stadium to face off against the Philadelphia Eagles following their first loss of the 2015 NFL season. The Patriots fell to 10-1 and welcome Chip Kelly and his 4-7 Eagles to Foxborough, MA. The Patriots will be trying to prevent consecutive losses since September 2012 when the Patriots lost to Arizona and Baltimore in back-to-back weeks. Do the Eagles have what it takes to pull an upset on the road against the defending Super Bowl champions or do the Patriots get back to their winning ways? Find out what will happen and who has the advantage when the Eagles try to run and pass and when the Patriots run and pass the ball. How did the Patriots offense fare against the Broncos top ranked defense? How did the Patriots defense do against the Broncos? A battle of two of the best in the AFC takes place on Sunday night as the New England Patriots face the Denver Broncos. Early on it appeared this could be a matchup of two unbeaten teams, but the Broncos dropped games to Indianapolis on the road and Kansas City before quarterback Peyton Manning was mercifully benched. With third year quarterback Brock Osweiler behind center last week, the Broncos managed to put up 17 points against a bad Chicago Bears defense to eke out the two point victory. The Patriots having been depleted due to injuries and having problems scoring make this matchup much closer than it appeared it would be a few weeks ago. The Denver defense is strong and tops in the league in fewest yards, fewest passing yards, fewest passing touchdowns, and second fewest yards per rushing attempt. The win over Washington was notable for the continuing run of injuries which tests the depth of the New England Patriots offense. Starting running back Dion Lewis was lost for the season to a knee injury and left tackle Sebastian Vollmer was lost to a head injury (presumably a concussion per reports) during the game. Without Vollmer’s strong pass blocking and Lewis, the Patriots turned to a retro 2003/2004 look with a run-heavy and quick-pass offense and shut down Washington with an attacking, aggressive defense. The Washington Redskins have been using the bye week to try and get their defense ready to play the explosive New England Patriots' offense. Their cornerbacks have all been dinged up this season and with run stoppers Terrance Knighton, Stephen Paea and Ricky Jean-Francois up front, the New England offense should again run through quarterback Tom Brady on Sunday afternoon as he looks for his deep group of pass-catchers. With the NFC East opponent not necessarily a known quantity, the Patriots have a lot of preparation work to get ready for Washington. With our homework done here at Cover32.com, here are the five key matchups that will determine whether the New England Patriots go 8-0 this weekend. The grades are in for the New England Patriots offense after their 30-23 win over the New York Jets on Sunday.The Patriots offense was able to score two touchdowns in the fourth quarter to turn a 20-16 deficit and turn it into a 30-20 lead. Led by quarterback Tom Brady, the Patriots wore down the Jets defense and pulled away to go to 6-0 in 2015. How did the offense grade out? The New England Patriots defeated the New York Jets on a cloudy and warm Sunday afternoon in Foxboro, MA. The Patriots continued their dominance in the AFC East as they improved to 69-19 against their division rivals since 2001. The Jets came in and gave the Patriots all they could handle–including being the first team to have a lead against the Patriots in the fourth quarter–but fell just short. With the win in the books for the Patriots, it is time to go inside the numbers and examine the 30-23 win over the Jets. The first number that jumps off the statsheet for the Patriots offense is 30. For the fifth straight game the Patriots scored 30 or more points and with 213 points in six games the offense is on pace for 568 points. The 5-0 New England Patriots faceoff against the New York Jets on Sunday afternoon at Gillette Stadium in Foxboro, MA. The Jets are a surprising 4-1 and are looking for a big road win against their division rival to stake claim to first place in the AFC East. In what has become the biggest test for the Patriots in this young season, as always the game will come down to the individual matchups on the field. To get ready for the game, here are five key matchups to watch on Sunday as the New England Patriots host the New York Jets. As much as the New England Patriots players will want to continue their dominance of the Indianapolis Colts, it will all come down to the matchups on the field at game time. There are key matchups on Sunday night which will determine the outcome of the game including tight end Rob Gronkowski vs the Colts safeties and linebackers, the Patriots defensive ends matching up with the Indianapolis offensive tackles running back Dion Lewis against whoever the Colts try to use to contain him. The Boston Celtics need to take the next step forward and finish above .500 and give themselves a chance to advance to the second round of the Eastern Conference playoffs, they need an X-Factor to step up and take their game to the next level. In the 2015-16 season, look for forward David Lee to be that X-Factor in Boston. While the bye week was at midseason last year, the Patriots have the earliest break in 2015. While head coach Bill Belichick and the coaching staff are using this week for self-scouting, it makes sense to look back and review the previous three weeks. With so little game tape at the bye week, here are four things we have learned about the Patriots at this early part of the season including the offensive line, running backs, the vertical pass defense, and the run defenders. Musketfire: Sealver Siliga: 2015 New England Patriots Secret Superstar? Sealver Siliga: 2015 New England Patriots Secret Superstar? New England Patriots defensive tackle Sealver Siliga is often overlooked as a contributor on the defensive line as he was with the team only a short time in 2013 and had an injury riddled 2014 season. Siliga is a premier run-stuffer with the strength and athleticism to get in the backfield and contribute as a pass rusher. Could he be a secret superstar for the New England Patriots now that Vince Wilfork is in Texas? With all their new parts on defense the New England Patriots' front-seven should be much more athletic, explosive, and pressure generating unit. Last season, the Patriots drafted interior disruptor Dominique Easley and have since added another young, aggressive defensive tackle in Brown in via the draft. However, the Patriots will need more surprise contributors like Malcolm Butler last year to step up in 2015, on defense to keep New England on the top of the NFL. Adding LeSean McCoy is a significant upgrade of the perennially injured and since departed C.J. Spiller and veteran Fred Jackson. However, the team has a lot of work to do in the preseason to improve upon their 9-7 record from last year. How many games will the Buffalo Bills win in 2015 in their first season under head coach Rex Ryan? As the New England Patriots are a mere four weeks from training camp starting, it is time to look at the potential impact the newest players from the draft can have on the team. How much playing time the rookies will receive this year? Who will be the immediate impact rookie who helps the New England Patriots stay atop the AFC East in 2015? Coming in at #83 on the First Stop Fantasy Top 100 Players of 2015 is…New England Patriots left tackle Nate Solder. Solder rarely makes headlines and hardly ever draws a group of reporters around his locker after a game. At a position where your name is only mentioned on the telecast when a mistake is made, it is actually a positive for Solder to be not talked about often. As he continues to perform at a high level, the secret of Solder will soon be known outside of Gillette Stadium. Well respected by his teammates and coaches, Solder will soon be mentioned in the same breath as other standouts on the offensive line around the NFL. Is he ranked too high, too low, or just right at #83 in the FSF Top 100? Which members of the New York Giants are going to launch your fantasy football team into first place? Can Odell Beckham Jr. replicate his rookie season performance? Will Victor Cruz bounce back from his knee injury and return to form in 2015? Is Eli Manning still a starting quality quarterback for your fantasy team? Is Shane Vereen ready to breakout with the Giants after his star performance in Super Bowl 49? Do the Giants have anyone to run the football in 2015? Who are the defensive players on the New England Patriots who were new in 2014 and now need to step up and be an impact player as they enter year two in the New England defense? Coming in at #92 on the First Stop Fantasy Top 100 Players of 2015 is…Detroit Lions Quarterback Matthew Stafford. Is he a top 100 NFL Player? Is his ranking too high? Too low? Or is it just right? While it’s certain the Browns will have an uphill battle in the competitive AFC North, the bigger question is can their fantasy options help you contend for your fantasy football league title? Can the Super Bowl Champion New England Patriots stars help your fantasy football team this fall? Who is the sleeper? Who is the most likely to disappoint? Which New England running back will be the surprise of your fantasy draft? 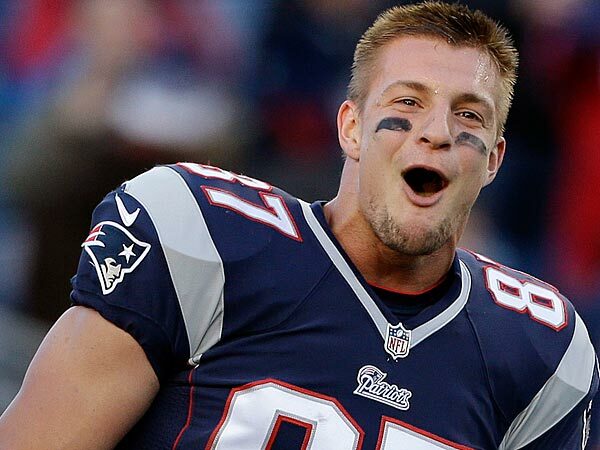 The New England Patriots ended the 2014 season with tight end Rob Gronkowski ready to party after winning the Super Bowl, and this was his first offseason without a surgery or rehabilitation since his rookie season in 2010. Holdovers Michael Hoomanawanui and Tim Wright return as well. New England was active in free agency, adding a pair of veterans in Buffalo’s Scott Chandler and Washington’s Fred Davis. In the draft they added to their depth by adding a late round project snagging AJ Derby out of Arkansas. In addition, in the OTAs, the Patriots moved former third round draft pick defensive end out of Arkansas Jake Bequette to tight end. Does New England finally have receiving options at tight end to make the two tight end offense a reality again? Coming in at #96 on the First Stop Fantasy Top 100 Players of 2015 is…Detroit Lions Defensive Tackle Haloti Ngata. Ngata was voted as the #82 “Top Players of 2015” by his peers in the NFL for NFL.com but comes in a little lower on the FirstStopFantasy.com Top 100 Players of 2015. Ngata’s age, position, and lack of flashy numbers may work against him, but he remains a dominant presence on the interior defensive line. Look for Ngata to continue his dominance against offensive guards and centers as he transitions to the NFC in 2015. How do you feel about Haloti Ngata's ranking? Too Low? Just Right? Too High? New England went into the offseason with their 2011 duo of running backs, Shane Vereen and Stevan Ridley, unsigned and free to sign with another team as unrestricted free agents. Vereen quickly cashed in with the New York Giants on a multi-year deal. His receiving skills out of the backfield should be a boon for quarterback Eli Manning in New York. Stevan Ridley missed the last 10 games of 2014 with a knee injury and was on the market a while. Ridley eventually got a one-year, “prove-it” deal from the New York Jets and will fight for a roster spot. The Patriots’ front office seemed unconcerned about losing their two prohibitive starters at running back for the past few seasons, mainly due to their depth at the position. As New England Patriots head coach Bill Belichick is keen to say, the biggest step from skill position players comes from year one to year two. It is literally the make or break season. This applies not just to rookies but to veterans in the unique New England Patriots offense. Who are the players who were new in 2014 and now may be a big impact player as they enter year two with the Patriots? Eli Manning considers himself an elite NFL quarterback and he has two Super Bowl Championship rings to back himself up. He went from #31 in 2012 to #42 in 2013 and then off the list last year and this year at NFL.com in their ratings. At FirstStopFantasy.com's Top 100 NFL Players in 2015 the gun-slinging quarterback leaps onto the list at #99 after missing the top 100 last year. Is he rated too high? Too Low? Just right? How do you feel about Eli Manning's ranking as #99 in the 2015 FSF Top 100 NFL Players? MusketFire: New England Patriots' Biggest Surprise On Offense in 2015? New England Patriots' Biggest Surprise On Offense in 2015? The New England Patriots added veterans Fred Davis and Scott Chandler and drafted project A.J. Derby to shore up the tight end position. At wide receiver, the Patriots imported former Rams and Dolphins slot receiver Brandon Gibson and returned deep threat Brian Tyms and 2013 second round draft pick Aaron Dobson. At running back they have 2014 fourth round draft pick James White and free agent Travaris Cadet. All of these new additions make for an interesting mix of talent, but where the New England will find their biggest surprise on offense in 2015? New England went into the offseason with a big contract at defensive tackle with veteran Vince Wilfork taking up a big chunk of salary cap space despite having reworked his deal the year before. Wilfork was released, but the Patriots brought back underrated young nose tackle Sealver Siliga and mid-season acquisition veteran Alan Branch. Pass rushing youngster Chris Jones and undersized defensive tackle Joe Vellano return, too. In addition, last year’s first-round draft pick was joined by another top college player at the position. Musketfire.com: New England Patriots' Biggest Surprise on Defense in 2015? New England Patriots' Biggest Surprise on Defense in 2015? The Patriots signed a duo of free agents with former Philadelphia Eagles cornerback Bradley Fletcher and former Falcons slot cornerback Robert McClain. In the draft, the Patriots waited until the seventh round before snagging Marshall standout and athletic Darryl Roberts. One or two of these three cornerbacks is going to rise up in training camp and become the starter for the Patriots. In order to challenge for another title, the New England defense will need to find a surprise contributor on defense for 2015. But who will it be? To ready for training camp when it kicks off over the summer, here at Cover32.com we will look at each position grouping during the coming weeks. With the loss of starters Darrelle Revis and Brandon Browner after one season in the secondary, the Patriots have turned over their starting group. Lost in the “deflategate” scandal the Patriots shockingly released starting slot cornerback Kyle Arrington. With Revis in New York, Browner in New Orleans, and Arrington signing with Baltimore the Patriots will have a new cast at cornerback in 2015. The New England Patriots' draft picks in 2015 confounded many NFL analysts as they anticipated a draft built around replacing cornerback Darrelle Revis, defensive tackle Vince Wilfork, and adding offensive weapons for quarterback Tom Brady. Instead New England balanced the present and the future as they shored up both sides of the football and addressed their needs in their typical manner. As frustrating as the 2015 NFL Draft may have been to New England Patriots fans, there was–as always–a method to the madness of the Patriots front office. The Buffalo Bills surprised many in 2014 as they were in the middle of the playoff picture for the first time in a decade before faltering down the stretch as they finished 9-7. The Bills gave up their 2014 first round draft pick and packaged this year’s first and fourth round picks last year to move up for wide receiver Sammy Watkins. Of course, they could have kept that extra first round draft pick and grabbed Odell Beckham Jr. The Bills need depth at linebacker and the secondary on defense and are desperate for help at quarterback and the offensive line. The tight end position also should be addressed. Who should Buffalo pick in the 2015 NFL Draft? The Patriots Will Draft at Least Two if Not Three Offensive Linemen: If there is one position that inspires fear in New England Patriots fans it is the offensive line. New O-line coach Dave DeGuglielmo received heaps of criticism as the offensive line struggled in the preseason and first few weeks of 2014. With a number of quality prospects on the offensive line in the 2015 NFL Draft, there could be a top talent dropping to New England at pick #32 overall. There may not be the star power on the offensive line in the 2015 NFL Draft, there is plenty of depth. New England Will NOT Take a Running Back in the 2015 NFL Draft: Last year the Patriots had just six running backs (counting fullback James Develin) on their 53-man roster. With Blount, Gray, Bolden, Cadet, and White likely to make the roster that leaves little room for a high draft pick. Do the Patriots take a running back to replace Shane Vereen or is James White and free agent Travaris Cadet the answer in 2015? Vince Wilfork’s Replacement is not Coming From this Draft: The Patriots have a big order to fill in finding a replacement for defensive tackle Vince Wilfork.In 2013 the veteran was injured early in week four and the Patriots defense suffered against the run the rest of the season. Without Wilfork, the Patriots did bring back two key defensive linemen from 2014: Sealver Siliga and Alan Branch. The Patriots also have 2014 first round draft pick. Dominique Easley who is expected to be back at full strength in 2015 and bring a pass rush presence to the defensive line. The NFL Draft analysts always talk about the unpredictable nature of the Bill Belichick draft picks for the New England Patriots. For the middle rounds that is true. However, in the first round the Patriots draft for need each and every year. This year, New England has needs in the secondary, the offensive and defensive lines, and at running back. So what position will the Patriots address int he 2015 NFL Draft? Here is analysis of some of the top mock drafters with who they are predicting will become the newest member of the New England Patriots at the end of the month. The New England Patriots finished the 2010 season with another disappointing post-season loss. After the 2009 season the Patriots were defeated by the Baltimore Ravens in the Wild Card round and then the 2010 season ended with a shocking loss to the New York Jets in the Divisional round. In need of an influx of talent, the Patriots turned to the 2011 NFL Draft to re-stock the pantry. The Patriots had needs on the offensive line, at running back, in the secondary, and finding a pass rusher. Did the Patriots succeed in filling their needs through the draft? How do they grade out now that the 2011 draft class has reached free agency? The New England Patriots finished a successful season with a Super Bowl win over the Seattle Seahawks; however, the off-season has not been kind to the Patriots and with a number of key departures on defense the Patriots have some holes to fill--particularly on defense. The offensive line, defensive line, and cornerback are three key needs in the NFL Draft. What other positions should the Patriots be looking to fill in the NFL Draft in just over a month? The New England Patriots have been a model franchise since 2001 and once again found a way to win in 2014. They continued winning right through the Super Bowl. Their beleaguered AFC East opponents have been busy this off-season spending tons of money on free agents as they try to "win" the off-season. But how does usually work out for teams? trying to catch-up to New England. The Patriot Way to build a team may frustrate the fanbase by watching starting cornerbacks Darrelle Revis and Brandon Browner hit the road and long-time defensive tackle Vince Wilfork not be brought back, the team has made a number of smaller, under-the-radar moves. The Patriots have been criticized for standing pat while the Bills, Jets, and Dolphins all spend millions and millions on free agents. But are any of the three other AFC East teams a threat to the New England Patriots in 2015 after all their moves? The loss of Vince Wilfork this offseason highlights the need at defensive line in New England. Rob Ninkovich is another year older and youngsters Dominique Easley and Sealver Siliga both struggled with injuries in 2014. Taking a look at what is in place, what is available via the draft and free agency shows the Patriots have a strong need on the defensive line for 2015. This past week I was invited to participate in a mock draft for Draft Season in their annual All-Blogger mock draft. Draft Season had asked a representative from all 32 NFL team's home base to participate. Draft Season simply requested every blogger draft as though they were drafting for the team they represent. I was asked to take the last pick of the draft for the New England Patriots and channel my "inner Bill Belichick". As much as my instinct told me to trade down, I stuck at #32 and made a befuddling pick just as I figured Belichick would do with the last pick of the first round. The mock draft made for an interesting piece as each blogger currently writes about the team they were choosing for and Draft Season had us write up a small piece about the pick. It made for a real interesting experience and gives some legitimacy for the real draft taking place at the end of April. Here is the link to the mock draft; Here is the link to part two of the mock draft where my choice for the New England Patriots is at #32. Check out the whole draft as it is real interesting. Analysis: Even if the New England Patriots lose both All Pro free safety Devin McCourty and All Pro cornerback Darrelle Revis in free agency this draft pick is not going to address the secondary. At safety, former third-round draft pick Duron Harmon would be given a chance to step in for McCourty after two years of seasoning. At cornerback, as the Patriots moved decisively in free agency to replace Aqib Talib with Revis expect the same move to get the next tier cornerback at a more team-friendly price in free agency. In the draft the Patriots–when they do not trade down out of the first round of the draft–more often than not pick based on need. Bill Belichick has a history of having his top draft pick stepping in and contributing immediately to fill a hole.This pick should be no different: Right now, their interior offensive line is in desperate need of an upgrade. Fourth-round draft pick Bryan Stork was solid as a rookie in 2014 but the two guard positions had almost every back-up guard, center or tackle start at least one game in 2014 in a quest to find a winning combination. Left guard Dan Connolly is 32 years old and a free agent. Even if he returns, the team needs a guard capable of stepping in and starting immediately. A decade ago the Patriots used the #32 overall pick on guard Logan Mankins and got a solid decade of service from him before trading him prior to the 2014 season. Look for history to repeat itself in 2015. A.J. Cann is the top guard in the draft and unlike in 2005 when the Patriots were panned for drafting an offensive guard in the first round the position has grown in importance and that has reflected in the draft boards. Cann is tall (six-foot-three) and has decent size with room to add weight (313 pounds). He is quick off the line and gets low and under his defender. He needs work in technique for pass protection but was a hard worker in South Carolina. The Patriots should be comfortable putting Cann to work on opening day at left guard and have him play a key role in keeping future Hall-of-Fame quarterback Tom Brady upright for the rest of his time in New England. The mock draft was a lot of fun and I really appreciate the opportunity. A big "thank you" goes out to Matt Falk at Draft Season for putting this together. Thanks, Matt!